Focus Fires, imagining the future for 50 years. 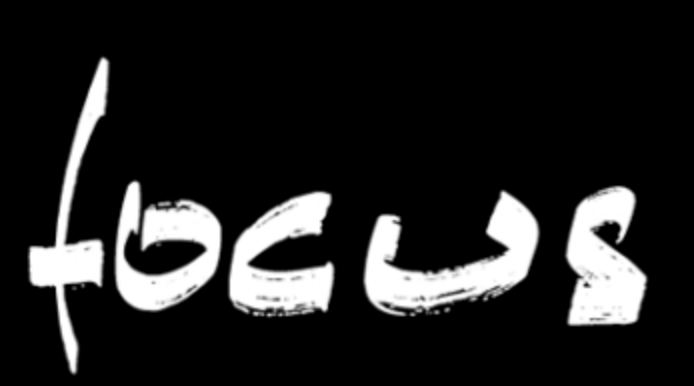 Focus fires have the ability to operate on battery battery power and can be connected to the mains by an adapter (optional). A remote control allows the control of many functions, including lighting and extinguishing the fire, adjusting the room temperature, programming the operating time and switching to eco mode. Inspired by its close relative, the legendary Gyrofocus, but in no way intended as a surrogate, the Magmafocus differs in several significant ways: it has a diameter that is 15 cm smaller and a base (which is attached to the floor, so the hearth does not pivot). 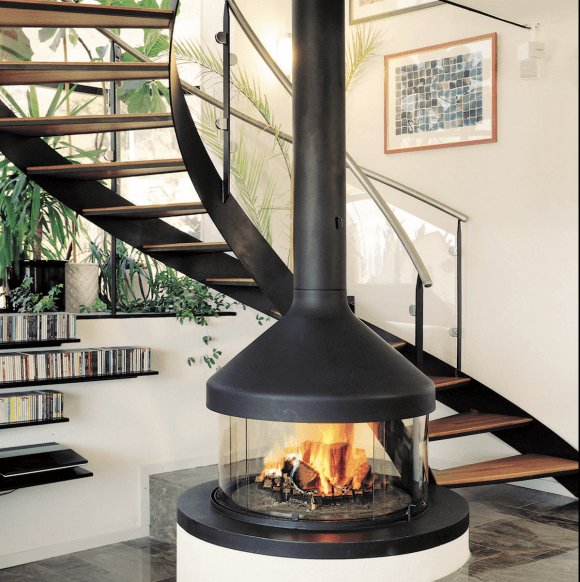 With a nod towards the sea, this round, compact fireplace is a serene, discreet yet warm presence, pivoting so the fire can be turned to any point in the room. 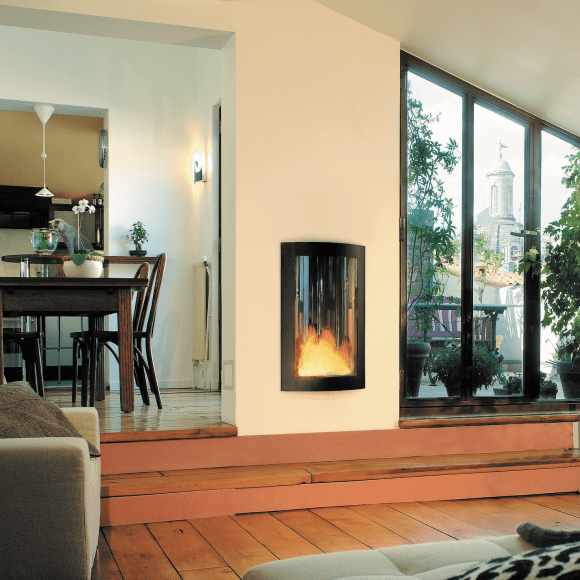 The model also comes in a porthole version with a closed hearth, which provides excellent thermal efficiency. This model can be installed directly on the floor, mounted on a base of black steel or masonry, or placed at the edge of a split level. 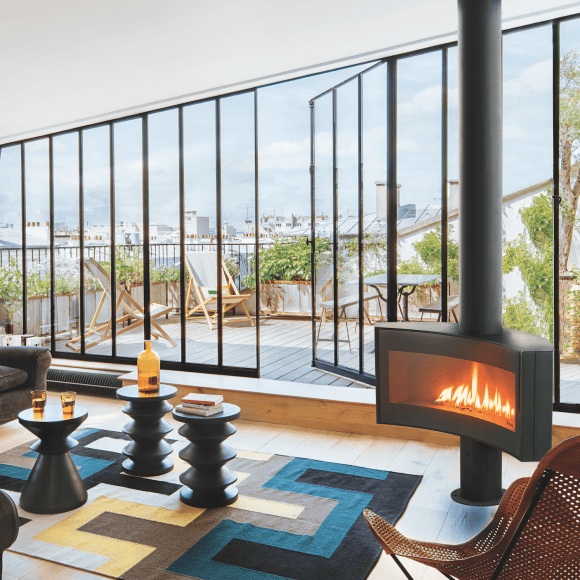 With its sliding glass panels, the Meijifocus allows the fire to be viewed in complete security, bringing it within reach of our living spaces. 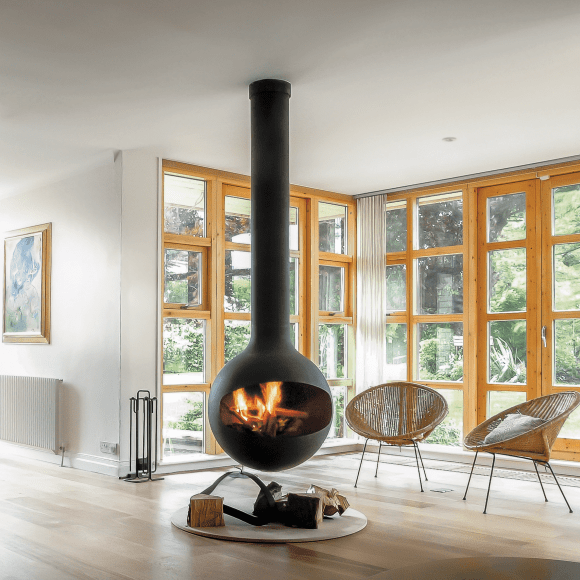 The Optifocus is a model that boasts several appealing features: an extended hearth shelf, a base that doubles as a wood storage space, a heat recovery system and curved sliding glass panels that allow optimal visibility of the fire, whether open or closed. The Gas versions are identical in size to the wood burning models. These models are supplied with a raised base that houses the electronic mechanism for the burner as well as the gas supply system. Audacious yet sober, this expansive fireplace proudly displays its flames in their full splendour. This model is enhanced whether placed centrally in a room, in a corner or against a flat wall. The panel consists of two slabs of wood roughly squared off and then cast in bronze with a mineral green patina. The upper panel slides open. The firebox is identical to that of a Néofocus. 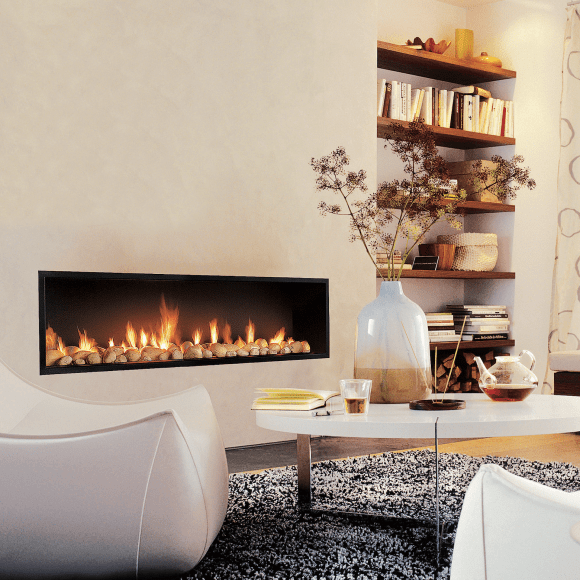 Fireplace equipped with a remote-controlled gas burner. The Néofocus widens the horizon of fire, letting the flames seek their liberty. 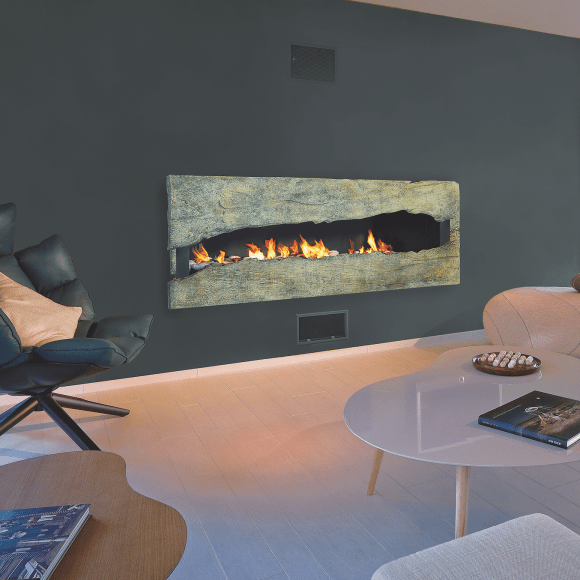 This fireplace’s talent lies in enlivening the flatness of a wall. 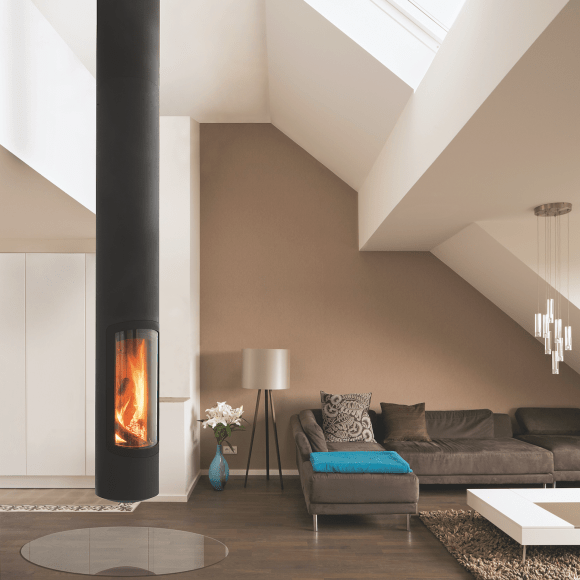 In both its versions, wood-burning and gas-burning, and two different widths, this model has taken prize position in our range. The Slimfocus is a periscope of flames. 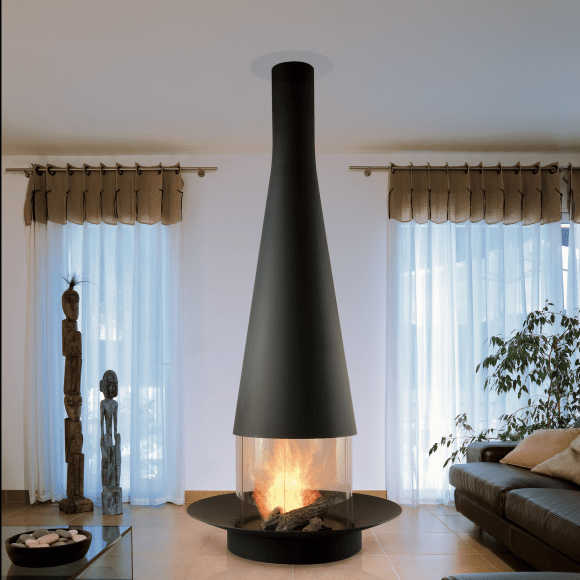 Its hearth is either suspended or supported by a base and fixed in place. Its streamlined shape takes up little space, whether it is positioned centrally in the room, near a wall or in a corner. 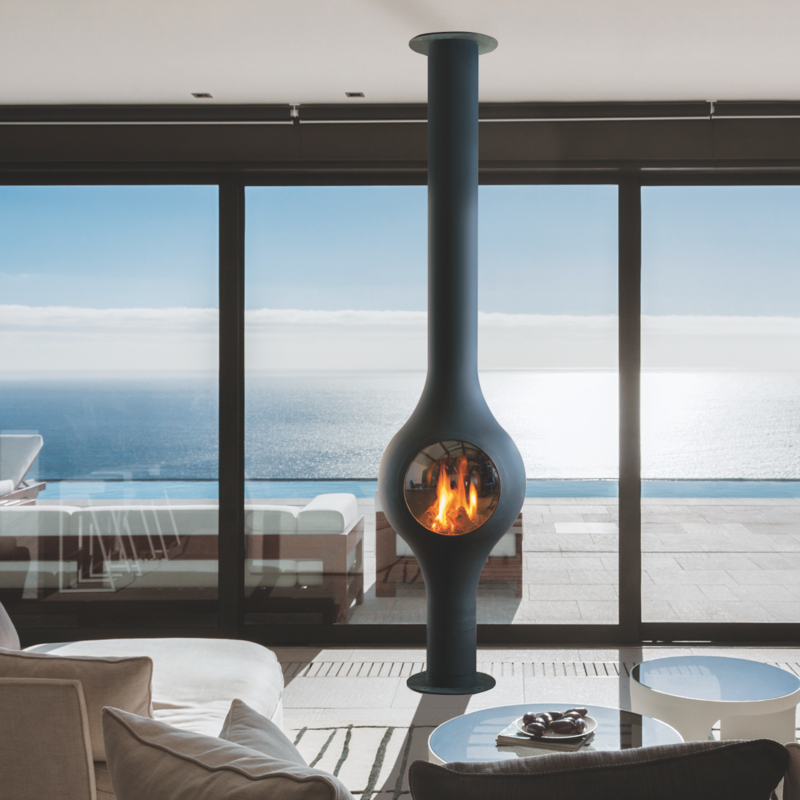 The world’s first concave gas fire, the Curvifocus offers an exceptional view of the flames and makes all eyes converge towards it. 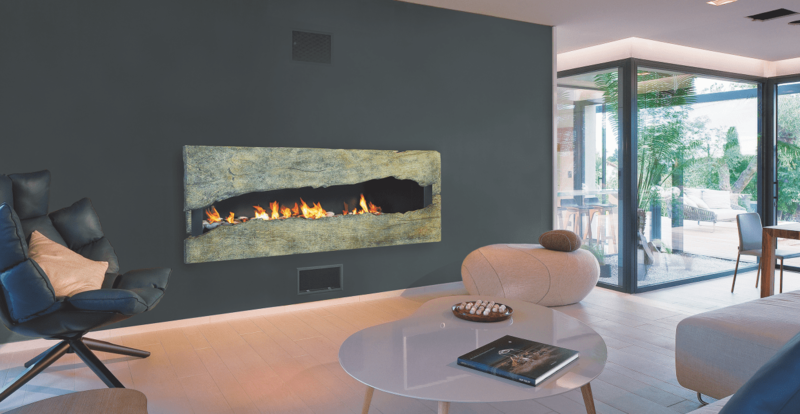 The simplicity of the shape of this fire belies its exceptional heat performance, making it eco-friendly and meeting European standards. 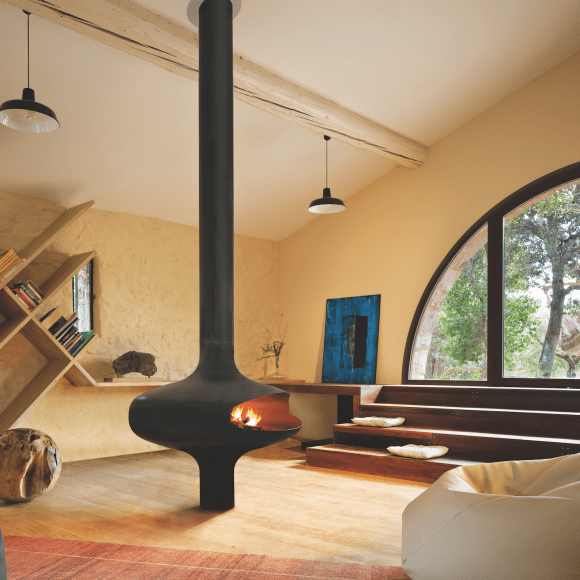 Grappus is more than a wood stove: it is a composition that rhythmically structures space, giving the fire the high one. 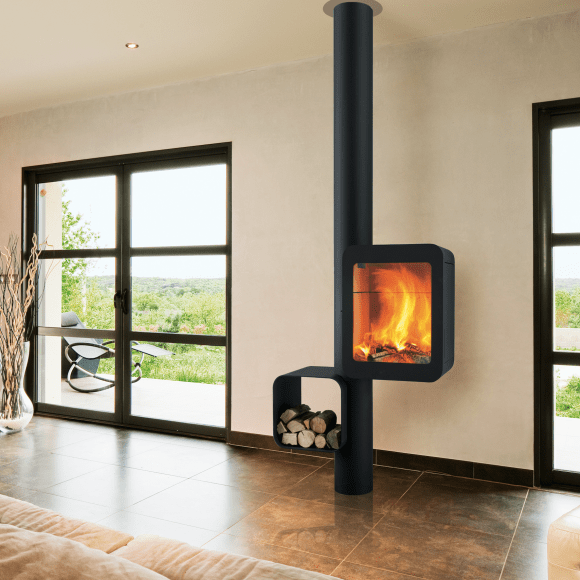 The height of the hearth, counterbalanced by the offset wood rack, makes the stove easy to use and adapts well to any space. 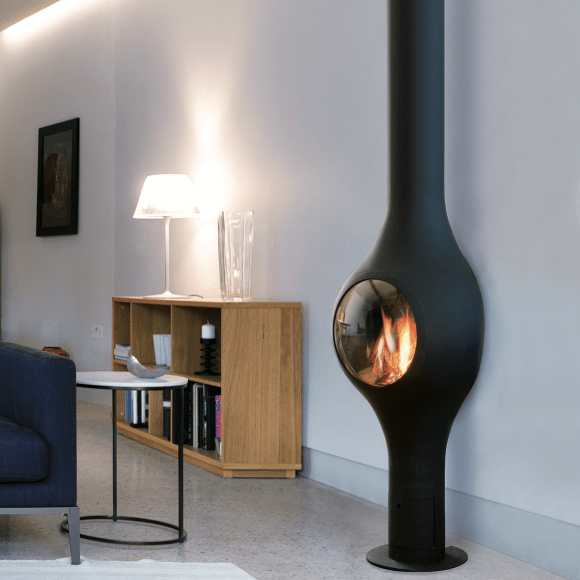 Aside from this anecdote, the Boafocus central model combines a svelte yet elegantly curvy silhouette with an efficient multi-functional gas fire. 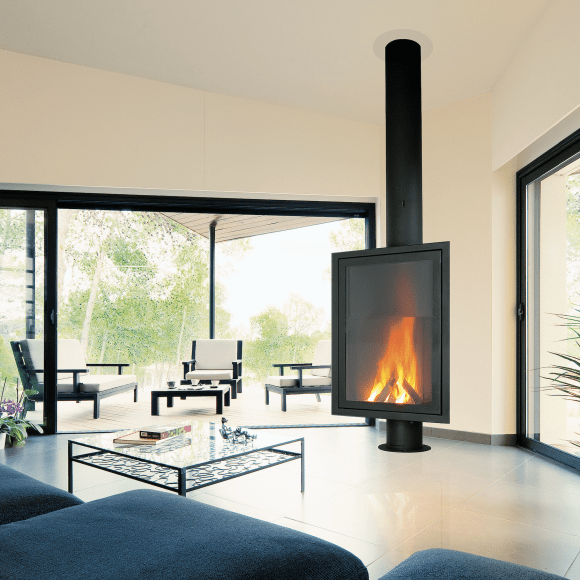 Supplied with ceramic logs and a curved double-glazed porthole, this CE-certified model with its compact size unites indisputable visual appeal with exceptional performance. Sharing the same design and performance as the central model, the hearth of the wall version has the same width but reduced depth. This allows it to be installed against a wall, freeing up more space. The Pictofocus allows the fire to embrace its public. The quiet power of simplicity guides the design philosophy of this model. 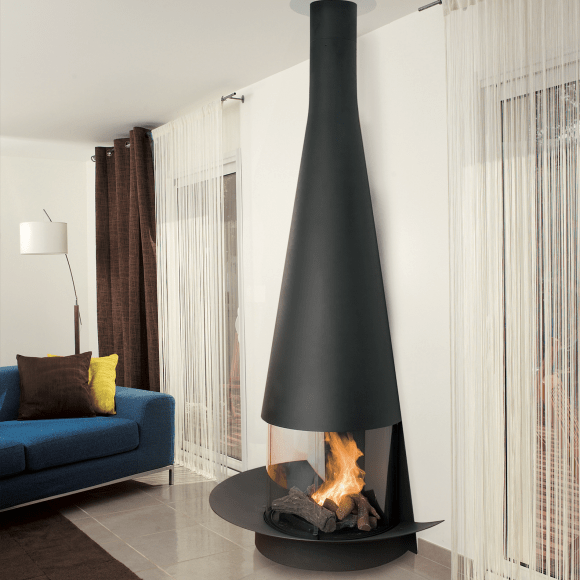 Its innovative, elegant lines avoid any distraction so the fire can take centre stage. 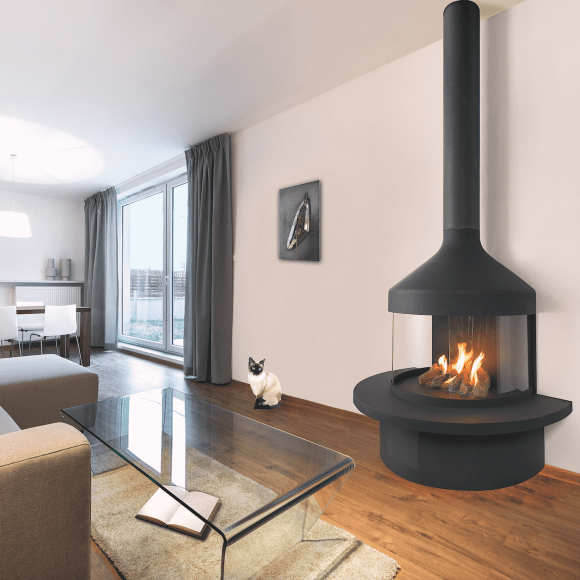 If you choose a Wendron Stoves engineer to install your stove then you have the confidence that he is HETAS qualified. As such, his work is guaranteed and safe. We have worked in the stove industry for over 30 years, so we like to think we have intimate knowledge of our industry. So when you come to us for help, you can be assured that we will give you the highest quality advice together with superb customer service.